What type of shoes you choose to wear for hiking is largely a matter of personal choice. 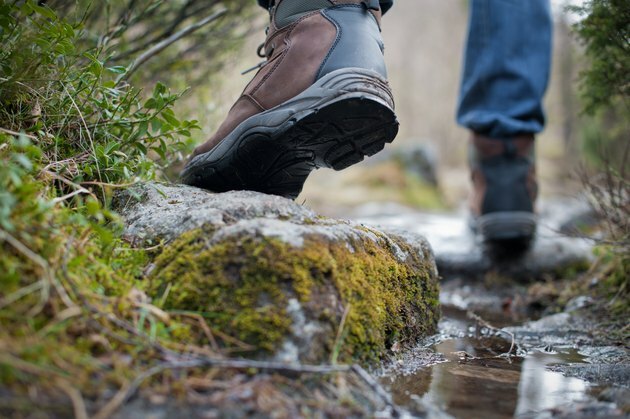 There are no stringent rules for what type of shoes are best, though different hiking boots or trail shoes are made for different terrains and it's important to choose wisely, especially if you are heading for a challenging backcountry hike. However, a tennis shoe or sneaker can work just fine if you're going on an easy, mostly flat day hike. One of the most important factors when deciding on hiking footwear is the amount of tread needed. The tread allows your shoe to grip uneven surfaces and prevent slippage on downhill slopes. Most sneakers or tennis shoes have light tread that won't be suitable for rocky, uneven terrain or hills. If you plan to walk a flat trail with only slight uphill and downhill grades, a tennis shoe will suffice. Any more than that and you should consider a hiking boot or trail shoe, suggests REI. Hiking shoes offer support and stiffness. If you are carrying a backpack while hiking the backcountry, you will want a true hiking boot with more ankle coverage and stiffer midsoles. If your ankles sprain easily, higher ankle coverage is a must. If you are doing day hikes with little or no extra weight from a pack, a light trail shoe is a good idea. They offer support and come up slightly higher on the ankle than a regular sneaker, but have stiffer midsoles to handle uneven terrain. There are hiking shoes -- sometimes called trail runners -- that feel almost like a sneaker in that they are light but offer more support and tread. Exposure to water while hiking is another consideration. Some hiking boots and shoes have a waterproof lining that allows you to walk through mud or streams without getting a soaker. Other outdoor shoes are made of mesh material that lets water flow through the shoe but are designed to dry quickly. Tennis shoes will stay wet and heavy under these same conditions. If you are an infrequent hiker that doesn't plan to go on any long, difficult hikes, then you can stick with your tennis shoes. But if you hike with any regularity, consider investing in hiking shoes so that you can be prepared for the changing trail conditions, including hills, uneven surfaces and rocks. Most sporting good stores have wide selections of hiking boots and shoes, so try on a bunch and take long walks around the store.